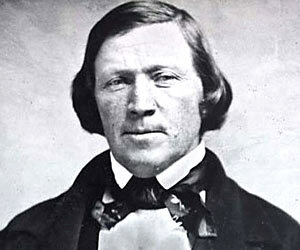 One thing I have always admired about Brigham Young is his pragmatic advice. Here is the first of two quotes by Brother Brigham on how to read the Bible that reflects his trademark pragmatism. Many Latter-day Saints are uncomfortable with using additional translations of the Bible besides the KJV, to say nothing of incorporating critical biblical scholarship into their study. I, however, am not. On my bookshelf sits four different English translations and two German translations of the Bible (including a number of study Bibles with critical notes and apparatuses) that I read regularly. Even worse, I have the temerity to read from the Hebrew and Greek and provide my own translation from time to time. Scandalous, I know. I have often wondered why we Mormons are always quick to cite the 8th article of faith (“We believe the Bible to be the word of God as far as it is translated correctly”) but are hesitant to actually integrate it in our Bible study. We often seem uncomfortable with actually acknowledging difficulties in the transmission and translation of the Bible, and sometimes display the same fundamentalist assumptions about the Bible that Joseph, Brigham, and others (such as Elders John A. Widtsoe, James E. Talmage, and B. H. Roberts) decried. I am confident that the work of critical biblical scholarship has largely vindicated the classic Mormon position on the Bible as articulated by Joseph and Brigham. We must acknowledge problems with how the Bible has been transmitted and translated over the span of its nearly three millennia-long history. That’s not to say that the Bible is worthless, or to disparage its role as scripture. It’s rather to be honest about the fact that, having passed through human hands and having been rendered in human language, the Bible is in many ways a human artifact. And humans, it won’t come as a surprise, are fallible. So let us have none of this nonsense about the Bible, including the KJV, having been infallibly transmitted and translated. I’m sorry, but no matter how pretty the language of the KJV is, that doesn’t solve some of its major issues vis-à-vis the inferior or problematic manuscripts used by the translators and their many instances of misunderstanding the Hebrew or Greek. So don’t be afraid to use alternative Bible translations to augment your study. I especially recommend the NRSV and the ESV. And, if you’re feeling especially daring, pick up what Hebrew or Greek you can to rid yourself of your dependency on others to understand the Bible. After all, anyone who relies on a translation of any text is at the mercy of the translator to have accurately executed the translation. I understand that this is to a large extent unavoidable. When I read Crime and Punishment in High School, for example, I couldn’t have practically learned Russian first. So I’m not trying to be some snooty elitist saying you have to know Hebrew or Greek before you can read the Bible or believe its teachings. What I am suggesting, however, is that one would do well to take a cue from Joseph and the early brethren in the School of the Prophets and do whatever can be done to learn the biblical languages. “Become acquainted with all good books, and with languages, tongues, and people” (D&C 90:15). Now for the second quote by Brother Brigham. I appreciate the importance of reading the Bible to “liken” its messages to us and our present day. I think that kind of reading has great potential to create faith and improve the lives of men and women. What becomes problematic, however, is when one sacrifices sound exegesis for only subjective application. When we read the Bible, or any scripture, for that matter, we shouldn’t forget that these texts were written in a specific time and place by real people. And these real people, it must be acknowledged, often had very different understandings of the world, society, and even God than we do today. A very helpful way to better understand the scriptures, then, is to try to put oneself in the place of the author. Try to image the world of the author, and try to recapture the thoughts and intentions of the author before you impose your own expectations or beliefs onto the text. I know this can be very difficult to do, but I also know it’s a very fruitful way to approach the scriptures. I can attest to this, as I have benefited tremendously from this method of reading the scriptures. What’s more, this is exactly what God commands in the Doctrine and Covenants. “Obtain a knowledge of history, and of countries, and of kingdoms, of laws of God and man, and all this for the salvation of Zion” (D&C 93:53). Try to not just learn from the scriptures, but to be challenged by the scriptures. Let these ancient and modern prophets challenge your expectations and assumptions. On the flip side, don’t be afraid to challenge these prophets in return when what they say doesn’t seem to fully jive with you. Wrestle with them like Jacob wrestled with a heavenly being before he received his blessings (Genesis 32:24–32). As Joseph said, “By proving contraries, truth is made manifest” (History of the Church 6:248). We do the scriptures a grave disservice when we daintily place them on some pedestal and insist we can’t ask the tough questions. “Search these commandments, for they are true and faithful, and the prophecies and promises which are in them shall all be fulfilled” (D&C 1:37). I like to think of this as the Lord’s challenge as much as his invitation to find truth in the scriptures. How else, then, can we discover this truth unless we take this challenge seriously? So give heed to Brother Brigham’s words as you read the Bible. His counsel is wise and will enrich your study of this wonderful book!